The Institute of Mineral Processing Machines focuses on the research and teaching of the development of energy- and resource-efficient machines for the economic and sustainable processing of primary and secondary raw materials. 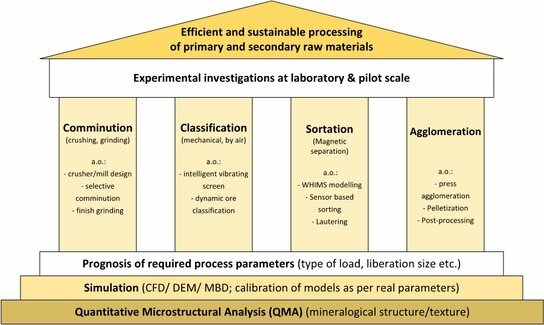 Based on an in-depth analysis of the raw material to be prepared, we develop ideas for a feasible processing technology, often with the aid of models and simulations.These are then verified in our test facilities, ranging from our small-scale mineralogical laboratory to our pilot plant in a nearby quarry. Booklet "Competence cluster for efficient raw materials processing"